Joe Manganiello isn't afraid to show some PDA ... even when Sofia Vergara isn't around! The "Magic Mike XXL" hunk took to Instagram to post a pic of himself puckering up to kiss a photo of his smokin' hot fiance. In the pic, the actor is standing next to a life-sized elevator poster promoting Sofia's upcoming flick, "Hot Pursuit," and he's seen planting a smooch on the actress' face. The couple is in Las Vegas for CinemaCon 2015, promoting their new movies. 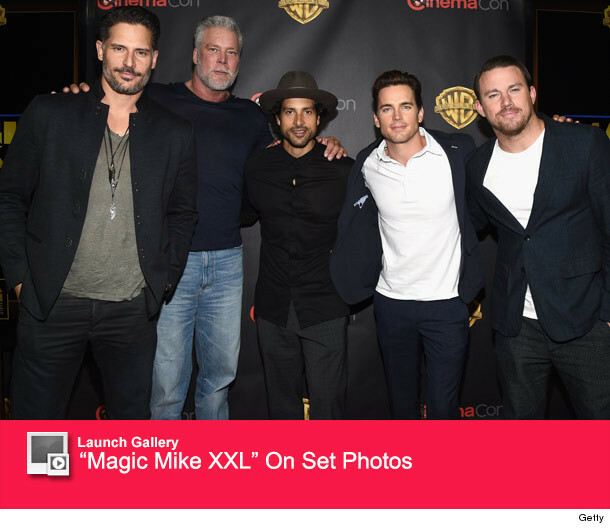 After he shared his PDA pic, Joe joined "Magic Mike" costars Kevin Nash, Adam Rodriguez, Matt Bomer and Channing Tatum at a press event at Caesar's Palace. Vergara and Reese Witherspoon were also in town to promo their flick. The "Magic Mike" press blitz is in full swing, and it's even affecting the couple's upcoming nuprials! "We wanted to get married this summer, but Joe will be busy working and promoting Magic Mike 2," Vergara recently told Page Six. "We want to get married at a time when we can get away and make time for a honeymoon, so the wedding will probably be later this year," she added. The pair first met in 2012 at the MTV Movie Awards, but reportedly didn't begin dating until September 2014. The actor proposed to Vergara in Kauai, Hawaii over Christmas. We can't wait to see these two tie the knot!